In our last post about Vembu BDR we have seen a detailed product review about Vembu BDR suite which couldn’t have been possible without product development / marketing team of Vembu Technologies in case you missed it here is the link for your reference http://blog.kanishksethi.in/2016/12/vembu-bdr-product-review_8.html. Dedicated this articles to talk about top 5 features of Vembu BDR suite which makes it a complete fit for small,medium and large infrastructure. 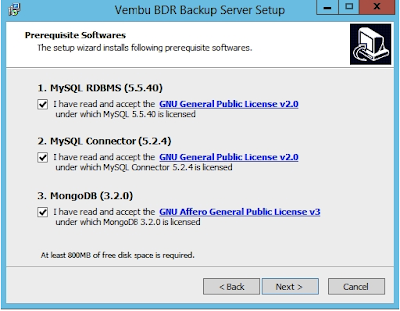 1) User Friendly Installation/Configuration - When it comes to installation and configuration Vembu provides simple installation and configuration of Vembu backup and disaster recovery suite, where in the simple executable file will download Mongo Database, MySQL RDBMS and MySQL connector and is supported for Windows Server 2008 R2, Server 2012 and Server 2012 R2 and Vembu also alternatively allows PostgreSQL as a single prerequisite software. As far as the configuration goes we simple provide the details about the vCenter Server or standalone ESXi, Stand alone Hyper-V host or SMB host which uses Server message block protocol (network file sharing protocol) and works with Vembu Storage Management Service which is pushed to each SMB host to perform change block tracking mechanism for Virtual Machines Disks or we can also configure physical machines by downloading Vembu ImageBackup Client Installer on our machine for backup physical server/ desktops as an image, and as far as applications like exchange,share point, outlook which are running on physical machines are concerned that has also been taken care by Vembu NetworkBackup Client installer which can be installed in our physical machines for easy file level backup. 2) Instant Virtual Machine Recovery- is one of the most important feature which always fascinate me not because it allows us to recover our Virtual Machine instantly but also it provides us the capability to restore our mission critical virtual machines irrespective of the fact what underline Hypervisors has been used (ESXi hosts, Hyper-v,KVM) this has been made possible because of the capabilities of Vembu that reads the backup data from storage target and accordingly creates different disks types like VMDK, VHD, VHDX and IMG disks virtually without making use of physical storage on Vembu BDR backup server machine. 3) Cost Affective - When considering backup and disaster recovery solutions in today’s competitive environment we often look for cost affective solutions which can give us more features and functionalities with a better performance and Vembu BDR solution has been upto the mark as it provides us agent less VMware vSphere VMBackup & Microsoft Hyper-V Backups with as low as $360 MSRP Per Cpu Socket Per annum for VMware VM’s and $240 MSRP per Cpu Socket per annum for VMbackup for Hyper-v, if in case you are planning about image level backup for your environment Vembu Image backup is a considerable choice as it available with very low cost of $180 MSRP per server/annum per server also if we are looking for backup solutions for your desktops/laptops it’s available as free. 4) Another layer of protection - Long gone those days when we use to have tape backup solutions for keeping our data on third site apart from production and backup data site and when it comes to moving backup data offsite it’s something that we all need to do to protect us against any disaster happened which might have failed both the production and backup sites.Vembu’s OffsiteDR add-on product to Vembu VMBackup offers us another extra layer of data protection with the help of which users can replicate data to offsite to another data center from their primary backup server. This helps the user to restore data directly from the OffsiteDR server which is similar to restoring it from a backup server with lesser amount of downtime and the user gets various options to recover wherein we can do a live restore to ESXi server, Booting a live VM. 5) Intelligent File System - VembuHIVE is patented file system by Vembu which help Vembu Backup and Disaster recovery solutions stand out from the crowd, Hive was designed keeping in mind the current cloud infrastructure solutions by perfuming smart metadata management.VembuHIVE exposes every incremental backup as a virtual full backup. i.e.when it comes to restoration of a backup we can do the restore with any time stamp.Also restoration of a backup will not require a merging of all the changes to a previous full backup these backup versions can be instantly booted or mounted.VembuHIVE also supports built in error correction by creating an additional parity file and the information in this additional partity file help fixing errors in any event of data corruption.